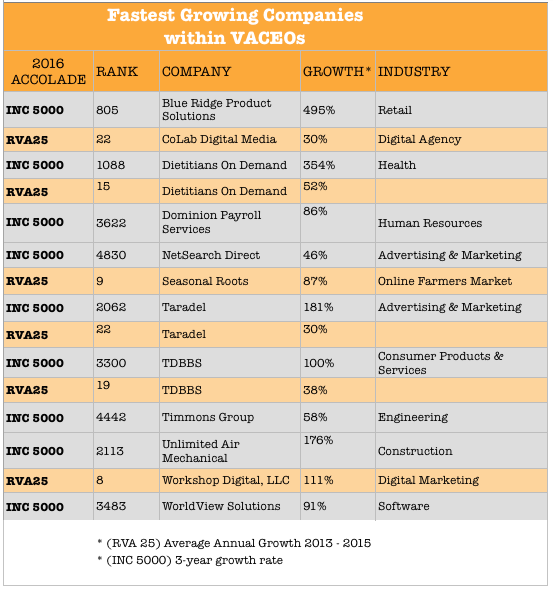 Our members represent a wide range of industries and experiences, and they are frequently listed within the annual RVA 25 and Inc 5000 “fastest growing” company lists. This year special congratulations go out to TDDBS (Best Bully Sticks), Worldview Solutions, Timmons Group and Unlimited Air Mechanical for making the Inc 5000 list. The company we keep is mighty fine. Take a look, and then imagine the hurdles you will overcome with access to such an exclusive network of leaders like these. Visit VACEOs membership to learn more.